No one will wonder what marching band is pulling up when the newly wrapped AHS band instrument/equipment bus rolls up this summer. 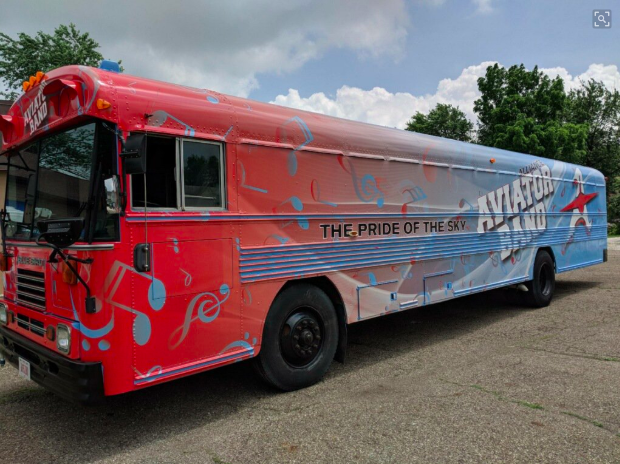 Thanks to work and fundraising from the Band Boosters the instrument bus received a facelift of blue and red decals noting "Pride of the Sky" and "Aviator Band" on the sides. The project began about 3 years ago when the AHS band was in a period of extreme growth, so much so that they had outgrown their instrument trailer. The decision was made that instead of renovating the current trailer or replacing it with a new trailer, to customize a school bus inside and out to haul all of the bands instruments and accessories. Alliance City Schools provided the bus and ACS Maintenance and Bus Garage Staff stripped the inside of seats, built custom shelving, and did other necessary alterations. A design was settled upon, and bids were taken on the exterior graphics. Ultimately the local company, CJ's signs, was hired to apply the exterior wrap. The end result is a highly attractive and very functional vehicle that will represent the band, the high school, and the community at dozens of events each year. There are still some elements that need to be dealt with on the bus; the addition of a ramp at the back of the bus, some additional exterior lighting, and a few other smaller items. Information about helping to fund those elements will be available at the event on the 5th. The Boosters have already raised about $4,500 for the project and hope to raise even more. For information about becoming a sponsor, contact Tyler Kinser at kinsertj@gmail.com or Fontaine at 330-829-1234 Ext. 2267. Information regarding the band’s effort can be found at www.aviatorband.com.